Archibald Gamble, the son of Sally Montgomery and Joseph Gamble, was born near Banbridge, Ireland, in 1740. Gamble immigrated to America with his parents and his sister, Margaret, around 1753. After spending two years in the colony of Pennsylvania, Joseph Gamble became dissatisfied and returned to Ireland, taking Archibald and his wife, but leaving his daughter Margaret with relatives of her mother. At the age of eighteen, Archibald Gamble once again embarked for America, with the aim of obtaining an education. 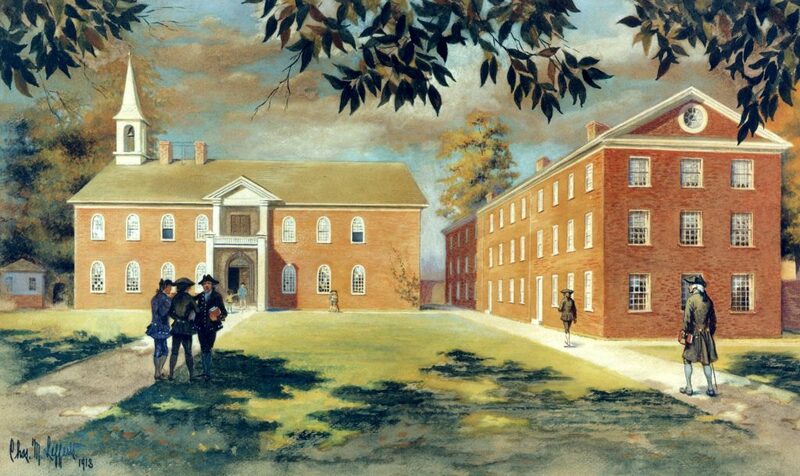 Gamble entered the College of Philadelphia in 1768, graduating with a bachelor’s degree in 1771. He was a Latin tutor while still an undergraduate, but received a master’s degree from the College of New Jersey (now Princeton) in 1772. Gamble returned to the University in 1782 as professor of oratory and English language, remaining there until his death in 1784. Gamble was also a Revolutionary War engineer who participated in the siege of Charleston, South Carolina, and a member of the American Philosophical Society since 1784. In 1777, he married Mary Lisle (possibly spelled Lyle), daughter of John Lisle of Philadelphia, with whom he had four children: Sarah, Nancy, Archibald, and Thomas. Gamble died in September of 1784 en route to welcome his brother Joseph, who was emigrating from Ireland to Delaware.